I have not opened it nor do I wish to until I've seen some replies to this post. Case description: semitransparent amaray case (kind of frosted clear). While the DVD case is shrinkwrapped, there is no security sticker inside along the top of the case. For mine, there is a blue strip along the top with the Paramount logo on the left. “Special Collector's Edition” is also in the blue strip. Below the blue is the word “Widescreen” in red text. Of note is the Paramount logo being top-cropped slightly from both that blue strip on the front cover and the side of the case. The cover illustration looks identical, though it is cropped off the right side. Amazon.com and Buy.com show the traditional Paramount blue strip along the top. Within that blue strip it states “Widescreen Collection” divided by the Paramount logo. Then below the blue strip is “Special Collector's Edition” in red text. Paramount's pretty good about not altering their look on regular releases such as this. I honestly think I have some sort of copy that the seller made. The DVD did take the entire length of time to get to me that Half.com allows and the seller was new with a zero feedback rating. He now has a feedback rating of 14, all positive. I paid $9.50 plus shipping, so if it is a copy, he sure didn't make much off of it. Can you all describe what you have in your hands? Clear case or traditional black is probably the simplest way to look. Last edited by lumberjack; 01-03-06 at 04:26 PM. Black. I don't know if Paramount has ever used a clear case. I have the DVD Empire cover art as well. Amazon has the original art posted, DVD Empire has the revised art posted. My case is an amary knockoff black, not clear or frosted. 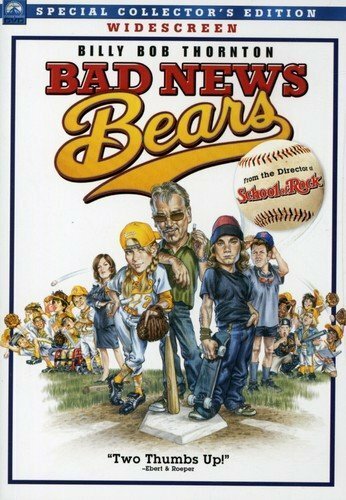 Bought mine at Best Buy in a bundle with the 1979 Bad News Bears. Thanks for your responses. Because of your responses and the one I received from the Half.com seller, I decided to open the thing. So in conclusion, is this seller getting away with a technicality? Is this in fact a factory-made release, where he just happened to get them from a Korean bootleg factory? I’m willing to watch the disc and be done with it, but if this is the sort of thing that consitutes piracy, I really want no part of it, no matter how inconsequential this case may seem. Thanks for any additional advice, folks! The Paramount copies also come with a baseball diamond shaped sticker that reads "Bases Loaded With Extra Features" or something along those lines. View Next Unread Future Pixar DVD's with DTS - ?